Militaire Begraafplaats, administered by the Military Heritage Foundation Curaçao (SMEC). This is a small military cemetery dating back to 1778, with the last burial in 1963. There are 90 graves in all. The cemetery was restored in May of 2008. 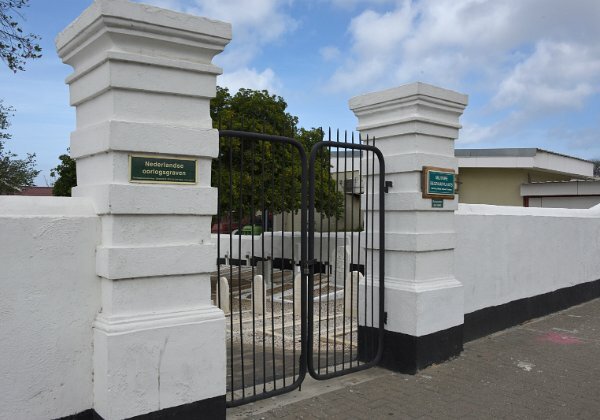 This cemetery is in the Otrabanda section of Willemstad, near several other cemeteries. It's next to a fire station on Roodeweg. Access is normally limted by a locked gate. The photos below are from those taken by others during the restoration completed in 2008. I am planning to visit and take photographs of my own, but for now I will document this cemetery with the images of those who did such a nice job restoring it!